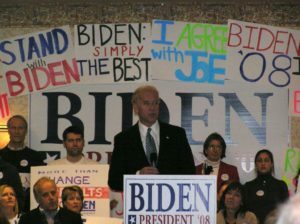 Biden on the caucus campaign trail in Iowa prior to the 2008 presidential race. Don’t worry: I’ll be back to politics by the end of the week. Content: I’ve been experimenting with trying to post new content on this blog every day. This is hard when you are a staff of one and have a life, but no new material, i.e., content. Of course, I don’t have much of a life at the moment, but I did play Hand & Foot Canasta all day today, so I don’t have anything “new” to share with all of you, except that the drive to play “Hand & Foot Canasta” is so far that it took me almost an hour to get there. And it starts at 11 a.m., so I was up early, for me. I had received a somewhat snarky request that I “not be late.” I was not late, but 2 other people were late (one never showed up at all), and, therefore, my table of newcomers who are learning the game started play with 2 “ghost” players represented by a piece of paper. Those hands were played by our best player (Inga) who did a remarkable job. Inga, who has a pronounced German accent, is truly a good player, as she was able to play HER hand and supervise the 2 pieces of paper that represented the MIA players, one of whom never showed up at all. Apparently you need either 4, 6 or 8 players; we had 5 by game’s end, which made the order in which we would draw and discard cards somewhat irregular. I am unclear whether we won or lost. That’s the truth. No idea at all. I think the first set of hands we were so far down that we couldn’t find up, so everyone decided that we would just call it a “practice round.” One woman (Katie) said she never cared about the score, anyway. That was fine if you’re Katie, but some of us who are going to spend 5 hours playing a game would like to know, at the end of that time, whether we “won” or “lost.” I’m thinking we “lost” the first round and maybe won (?) the last. Who knows? More content on that when I figure it out. What I do know is that I accidentally left my expensive metal cup in the rest room (I took my own ice because the ice situation is dire with the staff; they bring you a pitcher of water and a pitcher of iced tea, but no glasses, so…). I am sorry I left a $20 thermal cup in the rest room, but I have 2 bright spots of content to share. #1) I gave a homeless guy in an intersection with a sign one of my 2 cans of Diet Dr. Pepper at a stoplight. He had a sign that read “Anything will help” and it was the only thing I had time to hand him before the light changed. #2) I walked past a truly cool store at the Galleria (where the restaurant is located) and bought myself a white shawl-like garment that I will, henceforth, carry with me when the AC may be too cold…like all the time. More content on that as the temperatures in Austin soar to 78 or so in the next two days. So, tomorrow, I am either going to review “Glass,” the new M. Night Shymalan film, OR make predictions about the upcoming Oscars. Stay tuned for further developments. Let me know if you have a preference. Content! Content! Content!